A scattered few may have predicted that The White Stripes would become international rock stars based on their first two catchy, witty neo-garage albums, but even those early supporters probably doubted that Jack White and his ex-wife Meg would be able to maintain creative momentum for long with a sound based solely on drums, guitar, and the occasional piano. Yet after flirting with platinum-level sales with their third and fourth albums, 2001's rangy White Blood Cells and 2003's gritty Elephant—and after making a brief, pipe-cleaning stylistic detour with the moody 2005 album Get Behind Me Satan—The White Stripes have returned to blistering, riffy blues-rock with renewed confidence and skill on their Warner Bros. debut, Icky Thump. The album also finds them experimenting with distorted organ, bongos, and bagpipes, as well as bringing back Jack White's more overtly comic side. White recently spoke with The A.V. Club about writing and recording Icky Thump, the importance of spontaneity, and why a man who likes to control his music and his image frequently puts both in the hands of director Michel Gondry. The A.V. 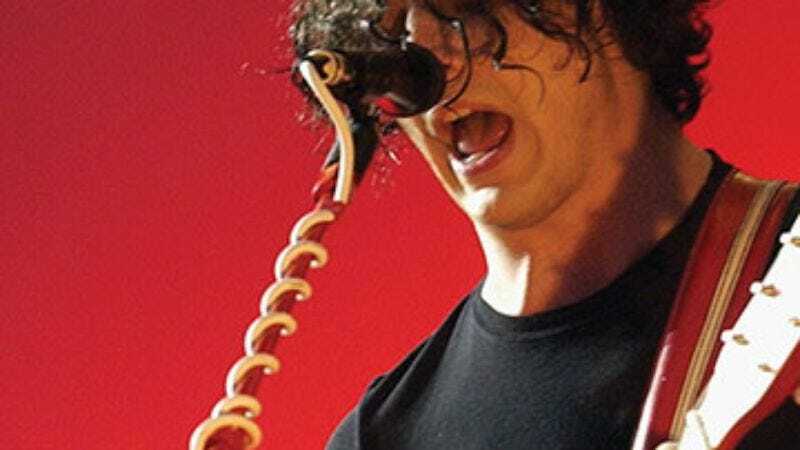 Club: You reportedly spent three weeks in the studio working on Icky Thump, which is the longest The White Stripes have ever spent on an album. What did the extra time do for you? Jack White: I haven't been able to figure that out yet. Sometimes when something sounds better, you play it back and you start wondering. Is it the new engineer? The new microphone we never used before? The type of tape stock? Or are we just a little bit more experienced than we used to be? I think this record sounds… the songs sound better, you know? And I don't know if that had anything to do with how much time we spent. Mostly the reason we spent more time was that we got really sidetracked while we were writing. In rehearsal, we got called away to do all this other stupid junk that was unavoidable. So we ended up needing more time in the studio to just finish writing the songs. I guess it's all for the better, though, 'cause we're happy with the finished product. AVC: The record still feels very loose, though. Not like you've worked the songs over and over. JW: Oh, good. Probably because, like most of our records, it was half-written in the studio right before we pressed "record." That always lends a sense of urgency and immediacy to the songs, to do it in that fashion. I like to work under those conditions. AVC: The song "Rag And Bone" is mostly a spontaneous-sounding dialogue between you and Meg. How much of that was written ahead of time, and how much did you improvise? JW: The music was written at my house, but all the dialogue was written in the studio. We actually have three different versions of that song, and I was worried that the version we have on the album now was a little too funny, and that people wouldn't get the metaphor because it was just too humorous. For a while there, we went back and forth deciding if we should put it on the record. At the last second, we said, "Eh, forget it, let's see what happens." And I'm glad we did, because people have responded to it really well. AVC:The White Stripes have always written a lot of funny songs, though you rarely get recognized for that. JW: I just get worried that sometimes when it's really up front, it overwhelms the longevity, the timelessness of the song. Sometimes if you hear a joke, "Ha ha, it's funny," but the next time your friend tells you the joke, you're like, "Eh, I already heard that joke." That's what worries me. But I think this song might just escape that. AVC: "Funny" often seems to be a matter of performance. You've done some acting. How would you compare performing as an actor vs. performing as a singer? JW: Well, it's different in front of a camera. I've learned from watching playbacks on a movie set that what you think is fake in your head comes off as not enough on camera, a lot of times. You almost have to overdo it, in this overly, sort of Broadway, large-gestures kind of way to come off as being realistic on camera. It's strange. I think a lot of people think, "Well, bad actors are just people who don't act like themselves. They don't act real enough, they act fake." But it's almost backward. You almost have to act really fake to come off looking real. Musically, though, you're a character and you're singing a song. If you're not your own character, you're the character in the song, most of the time. Even blues musicians, a lot of them who were the most realistic, at times, they were singing a song and portraying a character in the song. There's something to be said for getting involved in the emotion of a song, too, with the characters. AVC: A lot of your songs are written in second person. Do you have a certain person in mind when you write a song that's written to an unnamed "you?" Or are you sort of aiming into the ether? JW: I tend to write about other people's problems more than my own. I'm just saying, if everyone in the room put all their problems on the table, you'd take yours back before you took anyone else's in exchange. You know that phrase? I think that may be true for real life, that you might want to take your problems back, because they're the ones you can manage. But when it comes to writing songs, my problems are the least interesting to me. I'd rather get interested in other people's situations, you know, and attack it like a psychologist. AVC: Last year, when you were talking about the Raconteurs album, you said that you could tell that songs you wrote for The Raconteurs weren't White Stripes songs. Does a White Stripes song have certain parameters? JW: Oh yeah, lots of them do. There's an overall structure of simplicity, and it revolves around Meg's drumming style. And it can't be beat. We can't do those structures in The Raconteurs. We couldn't do them if we wanted to, and that's the beauty of Meg. In The Raconteurs, there's so many more components, so many more personalities involved. If you get another person in the room, you're dealing with something else. It's a different kind of collaboration, you know? But yeah, the parameters of the White Stripes… you know, 70 to 80 percent of what we do is constriction, and the other 20 to 30 percent is us breaking that constriction to see what happens. And when we do break the rules, like, "What if we do 16 tracks of vocals on this? ", it's something we obviously can't do live. And people notice that, because of the structure of the band. "There's two people here, and this song is explosive and crazy, there's no way they could do this live." Not the case with The Raconteurs. People listen to it and don't think about it at all. They just go, "Oh, there's a bunch of guys in this band, someone must be playing that synthesizer." No one says "How the hell are you going to play 'Broken Boy Soldier' live? You guys don't have a pump organ onstage!" But they say it to The White Stripes. It becomes a debate, which is great, that people realize that those rules are in existence. That's a great thing to recognize. AVC: How much do you think about the live show when you write a song? JW: Well, live, we don't ever have a set list, and we don't talk about what we're going to do. And I like that we didn't talk about it. I've always thought that if you say to somebody, "Okay, make sure you've got the lighter fluid and a box of matches on top of my amp, because I'm gonna set my guitar on fire tonight," and it gets managed in some way, there's no excitement to it. It becomes a different thing altogether, again, like a Broadway show. But if I just have lighter fluid in my pocket, and I have some matches tucked under my sleeve, and I come out and just do it, and I don't even tell Meg about it, then something explosive happens. I think the crowd immediately can smell when something's not planned. And I think they appreciate it very much. When the crowd notices something that wasn't planned, they notice that something unique happened tonight. And in an era of, "Everything is pre-planned and, lip-synced, sampled, and computerized," I think people really appreciate something that they know nobody else can experience, except people who were there that night. AVC: The new album has bagpipes on it, and the songs "Icky Thump" and "Rag And Bone" both reference British slang. You didn't record in the UK this time, but it sounds like you're still kind of an Anglophile. JW: Well, yeah… I call it "sideways exotic." People who speak the same language but live in different countries. There's something exotic to these phrases that we don't hear in America. And even moreso, what's very interesting to me is how many different types of accents there are in Great Britain, in a place that's about the size of Michigan. Imagine if the people the next town over from your town had a different accent than you. I find that really bizarre. So many dialects in one tiny little place. You'd think on an island, everyone would talk the same, you know? It's pretty funny. AVC: Would you say that you're less of a musical traditionalist now, or was that always kind of overstated? JW: I don't know. It kind of goes back and forth with how people perceive what I do. I have a lot of opinions about those things, and they mostly concern my life. I don't like to tell people what to do or anything. But you get a lot of things thrown on you. People, for example, think that I'm a sellout because I wrote a song for this Coca-Cola commercial. Or, because we used more tracks on this album, we've sold out the entire DIY ideal of The White Stripes, whatever that is. I mean, I don't really remember signing some declaration, you know, stating the way that things are supposed to be on Planet Earth. [Laughs.] "Join my army, please, if you will." You know, people ask me, "How do you like to do stuff?" So I tell 'em. You know, "I like to record on analog tape," or such-and-such. That kind of thing. People are always up for headlines, so if you say anything off the beaten path, it becomes a headline. And then the headline gets misconstrued as your manifesto. That's the funny part. AVC: You made some headlines recently when you called up and bawled out a DJ at a radio station for playing Icky Thump early. Do you think you overreacted? AVC: What exactly is the problem with playing an album on the air too early? JW: Let me ask you: What do you think the problem with playing a movie three weeks before it comes out would be? What would be wrong with that? JW: [Laughs.] Oh well. These days, any reaction is a bad reaction. I don't care. Their reaction is equally hilarious to me. AVC: You wrote a song on the new album, "I'm Slowly Turning Into You," based on an idea for a video that Michel Gondry told you about. Is the video done yet? JW: Michel hasn't heard the song yet. JW: No, I don't think he's heard it. I haven't talked to him about it. The question is, is it going to be a single or not? Even if it's not a single, I really hope we film the video. We'll have to find out what's going to happen, but I haven't talked to Michel yet, sorry. AVC: What do you get out of working with him? JW: When it comes to Michel, I almost don't even care what the treatment or the idea is, I just want to work with him. I was just watching his video today, the Paul McCartney video he directed, and just the little tiny things that I know he puts in there, that can only be seen if you watch it multiple times, are amazing. And in an age of everything being gimme-gimme-gimme now-now-now, he sticks out like a sore thumb. I like the fact that he's very anti-that. He's very hands-on, and makes all the things on the set if he can. And he doesn't cheat and use computers, or whatever you want to consider "cheating." He really does it, for real. He can be proud of himself, and I'm really proud of him. So any idea of how the video's going to be… I just want to see how he's going to make everything happen. It's always interesting. When you see somebody do something on TV nowadays—when you see something cool, for example, on a video—a teenager's first thought is, "Oh, they did that on a computer." But when I watch a Michel Gondry video, my first thought is, "Wow, how did he do that?" Because I know he probably didn't do it on a computer. And that's what's great. That's what inspires you. Old special effects in movies are so beautiful to look at compared to the CGI stuff now. It's just like, "Well, whatever, who cares, I mean, they did it on computer." So where's the beauty? You know, you figure out how to throw a train over the side of a cliff and make it explode in mid-air, and it looks real, like back in the '70s… There's a real beauty to that. AVC: How much do you have to think about maintaining your profile in pop culture? You talk about how fast things come and go. Do you give some thought to what you can do to make sure you still have a presence? Or do you even care about that? JW: I could give you the easy answer, and be one of those people who says "Oh, no, I don't care about that at all." But in the big picture, it is almost useless to try and think about it. If you're a pop star, you live in this sort of post-Madonna world where you have to reinvent yourself every album. My heart goes out to those guys, because I couldn't keep up with that, you know? It's almost like you have to dye your hair a different color for every album. What's the point of that? What the hell does that have to do with music? I'm glad that all I have to care about is, "Oh God, I hope some more songs keep coming out of me." AVC: Do you see yourself as competitive with other musicians of your generation? JW: No, I give up! [Laughs.] I surrender! I watch MTV, I listen to the radio, and I just give up. I don't know to record like that, I don't know how to be "current." Anytime I do something and it sounds "modern" to me, someone is quick to point out that it sounds like something from 30 or 40 years ago. You know, I give up! [Laughs.] That's never been a battle that I wanted to fight to begin with, but even the times I think about it, I think that even if I wanted to, I wouldn't even know the first thing to do.